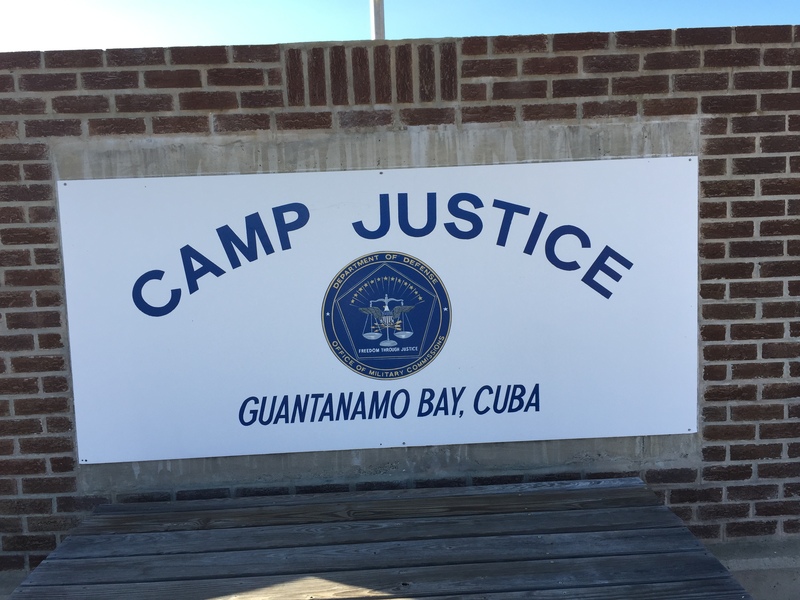 The Gitmo Observer has shared the Guantanamo Bay Fair Trial Manual with many NGO Observers and others who have traveled to Guantanamo Bay, Cuba or Ft. Meade, Maryland to monitor U.S. Military Commission hearings. We have also shared the Manual with many others who may or may not have involvement with the Guantanamo Bay proceedings. Comments returned to us on the Manual have been generally very favorable, constructive, helpful and supportive. From time to time, the Gitmo Observer will post some of these comments on our website. 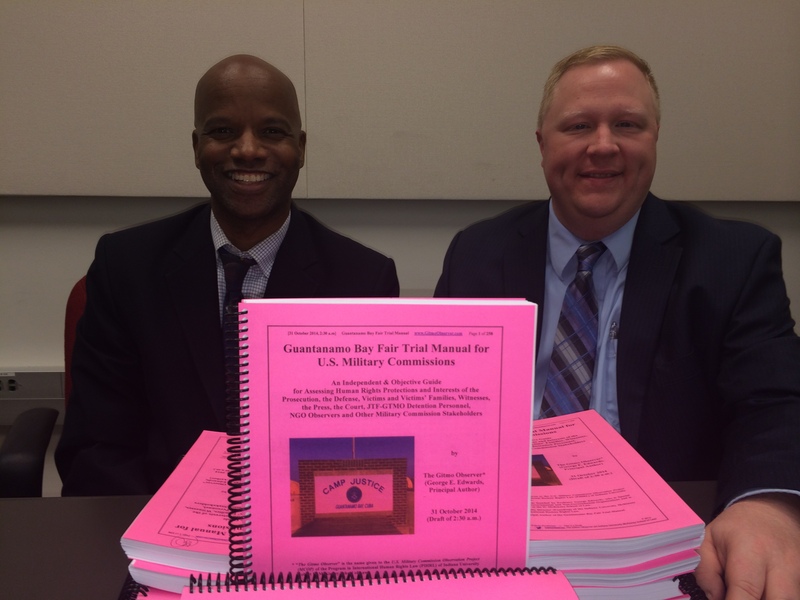 If you have any comments about the Guantanamo Bay Fair Trial Manual, please let us know! Please write to us at GitmoObserver@yahoo.com. In short, we are happy to hear from you! As part of a group of non-governmental organization (NGO) observers from across the United States, I spent the past five days, November 16-20, at the U.S. 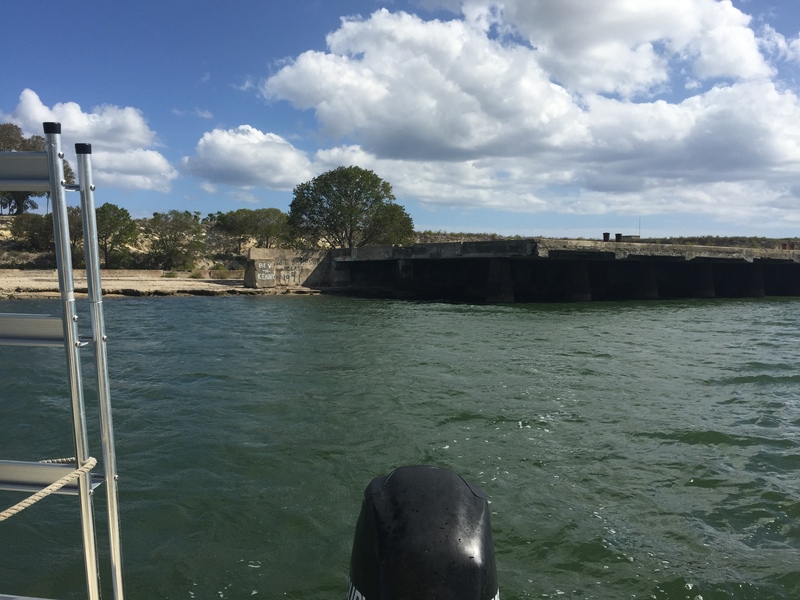 Naval Station in Guantanamo Bay, Cuba (GTMO). My mission as an NGO observer was to attend, observe, analyze, critique, and report on the week’s pretrial proceedings in the government’s case against Abd al Hadi al-Iraqi. Hadi is accused of several crimes arising out of his alleged role as an al Qaeda commander in Afghanistan during the post-9/11 period. 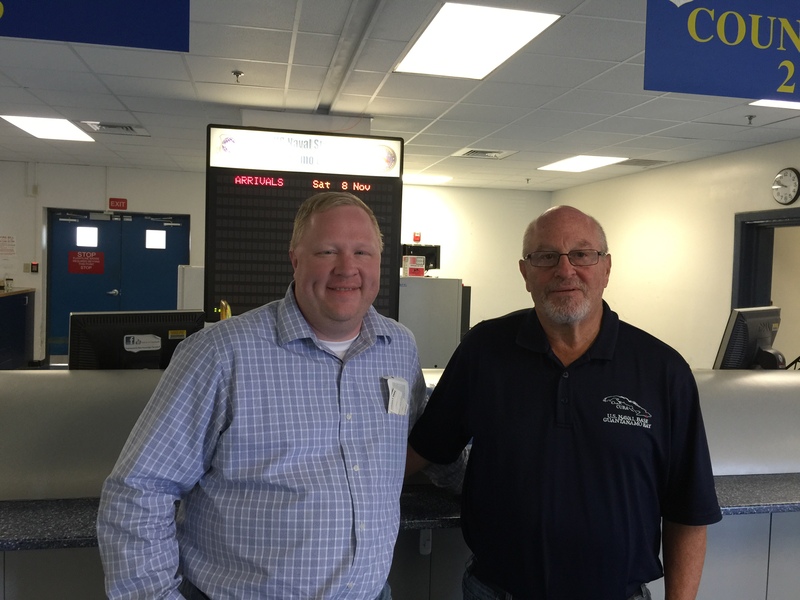 I returned home late last night (Thursday, Nov. 20) to Indianapolis via Andrews Air Force Base. Breaking in the media today was news of the release and transfer abroad of five long-term Guantanamo Bay detainees. Five Yemeni detainees deemed of low threat to the U.S. were released last night and accepted today for resettlement in Georgia and Slovakia. The Department of Defense confirmed the transfer Thursday afternoon, and Carol Rosenberg of the Miami Herald was following the story as it broke. And without realizing at the time what I was observing, I watched last night around 8:00 p.m. as a plane departed Guantanamo Bay Naval Station, apparently carrying the transferees. As the NGOs sat around the tents last night discussing yesterday’s observations, the sound of an aircraft departing disturbed our conversation and we all looked up into the night sky. Not accustomed to observing nighttime plane departures at Guantanamo, one of the group remarked, “I wonder who is on that plane.” Now we know. The Military Commission hearing pre-trial motions in the U.S. government’s case against Abd al Hadi al-Iraqi reconvened Wednesday, November 18 at 1:00 p.m. Hadi is accused of several crimes arising out of his alleged role as an al Qaeda commander in Afghanistan during the post-9/11 period. Before convening today, Commission Judge Captain Kirk Waits conducted conferences with the parties on various issues including some anticipated to arise on Wednesday. The first issue addressed was the status of defense motion AE 21 requesting that female guards cease certain physical contact with Hadi. The Commission previously granted Hadi’s motion on a temporary basis and the motion was expected to be argued on the merits in this week’s session. But apparently at Tuesday’s conference it became apparent that Hadi’s defense team had been unable access certain evidence that it intended to use in support of its motion. Specifically, Hadi objects to being touched by unrelated females based on his religious beliefs. The government argues that the operational security needs of the detention facility require the use of some female guards. The offensive touch typically occurs during the shackling process when Hadi is being moved from his cell to another location. Apparently in October when Hadi so objected to being shackled by female guards, he was “forcibly removed” from his cell over his objection. A video of this forcible removal exists and has been in the possession of the prosecution team for over two weeks. However, due to problems with the security process (due to the highly classified nature of the video), the defense team was unable to view this evidence until just before Tuesday’s hearing. Additionally, the defense has not yet been provided access to witnesses to the touching and to evidence and/or witnesses confirming the security needs of the detention facility. While the government argued vigorously against extending the time for argument on this issue, the Commission seemed to recognize that the defense could not present a viable substantive argument on the issue without more discovery. The Commission noted that if Hadi is presented with the choice of being shackled by a female or forgoing a meeting with his defense counsel, Hadi’s beliefs apparently prevent him from meeting with counsel or attending his own proceedings. “That is the most basic of due process,” said Judge Waits. And in addition to these rights being recognized under the United States Constitution, they are recognized under numerous internationally binding treaties as well as the Military Commissions Act itself. But also seemingly recognizing that the government has an interest in operating its corrections facilities in a safe, effective, and efficient manner respecting the rights of all genders to equal employment opportunities, the Commission ordered the parties to submit additional briefing on the issue prior to the next scheduled set of hearings in late January. After wrapping up the briefing schedule for the access to witnesses issue, the Commission issued an oral ruling on one of the motions argued Monday, AE 20. Readers may recall that this motion concerned the defense’s request that Hadi is entitled to a hearing pursuant to Article 5 of the Geneva Conventions in order to determine his status and thus what type of tribunal may try him for the alleged war crimes. Hadi contends that he should be presumed a prisoner of war (POW) and thus may not be tried by a Military Commission. He asked for a determination be made pursuant to Article 5 which provides a particular procedure with a specially constituted panel for determining status. The government argued that Hadi is clearly an unlawful enemy belligerent subject to the jurisdiction of the MCA and no further status determination is needed. Rejecting both parties’ positions, Judge Waits on Wednesday granted the defense’s alternative request, which was that the Commission itself make a determination as to Hadi’s status for purposes of jurisdiction. No open courtroom proceedings occurred on Wednesday, but the parties and the Commission held a Rule 802 scheduling conference to hammer out the way forward and to prepare a plan for the next set of hearings which will occur in late January. The non-governmental observers (NGOs) of the hearings thus had a day devoted to learning more about the facilities associated with the hearings and the detainees. First we were given a detailed tour of the courtroom complex and its related facilities, including the cells used to house detainees on days when they make an appearance in court. 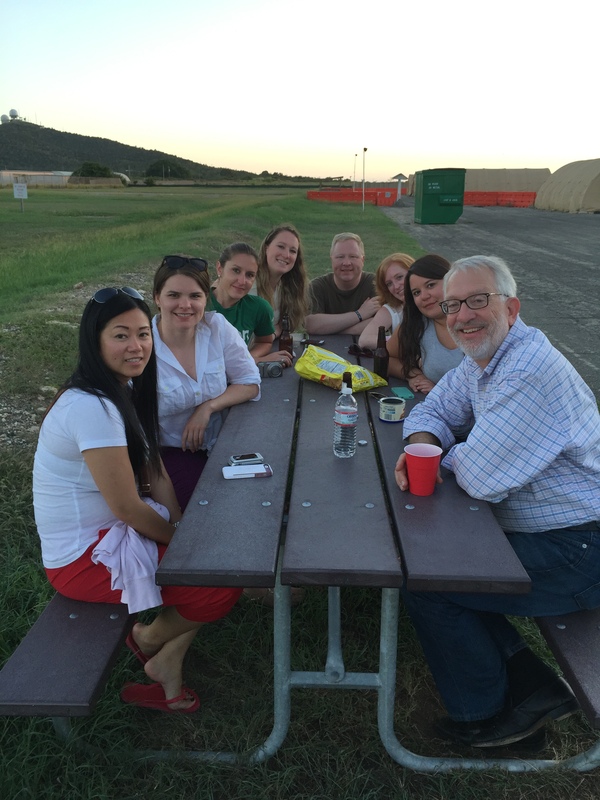 Next, the Joint Task Force Public Affairs Office graciously led the NGO observers on a tour of now-closed Camp X-ray. NGOs being led through Camp X ray by Army personnel. 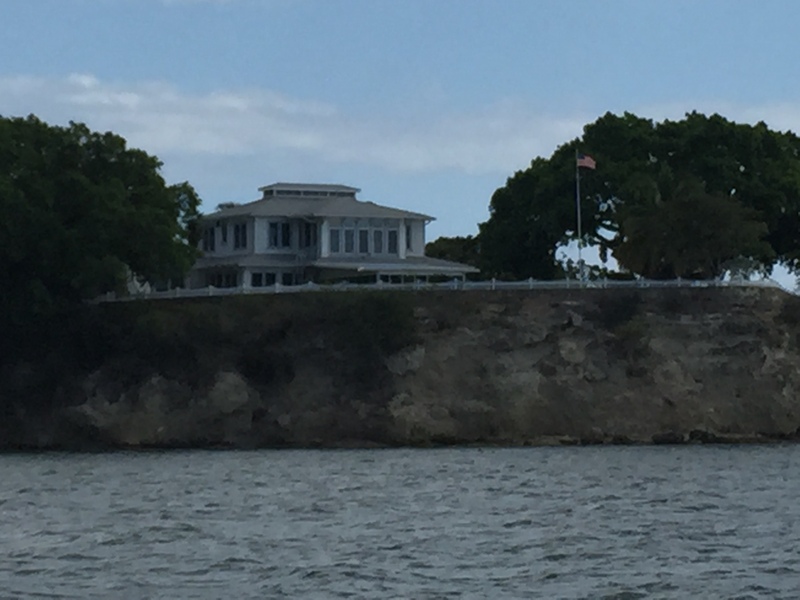 This area was used in the 1990s to temporarily house the large influx of Haitians arriving at Guantanamo seeking refuge in the United States. For a period of spanning late 2001 and early 2002, Camp X-ray was used to house detainees who were captured in conjunction with the U.S. actions in Afghanistan and elsewhere after the 9/11 attacks. The conditions were quite primitive, and essentially consisted of a small, covered area enclosed by chain link fence for each detainee. The entire camp was of course heavily guarded and surrounded by concertina wire, most of which still appears to be in place. Fortunately, the government constructed a series of newer, more humane detention areas to house the detainees when it became apparent the situation was not going to be temporary. 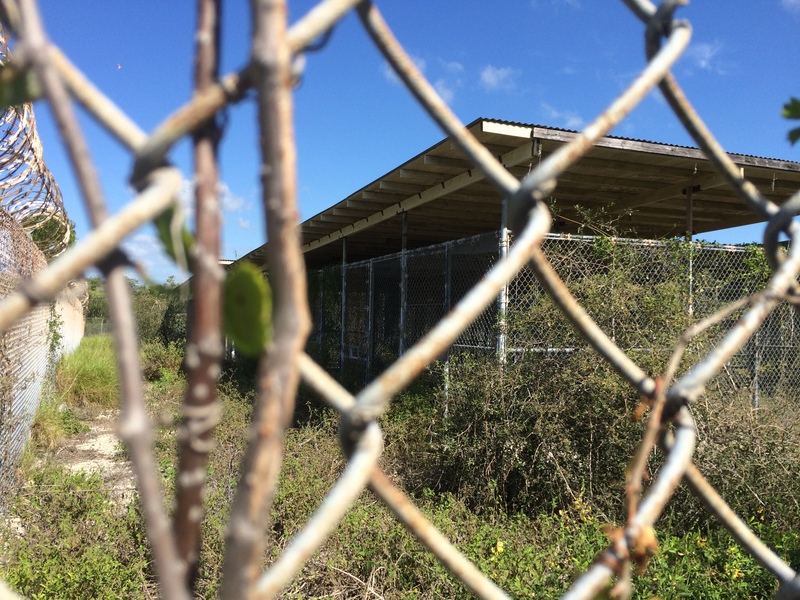 Camp X-ray is being conserved in its present state for historical and legal purposes. 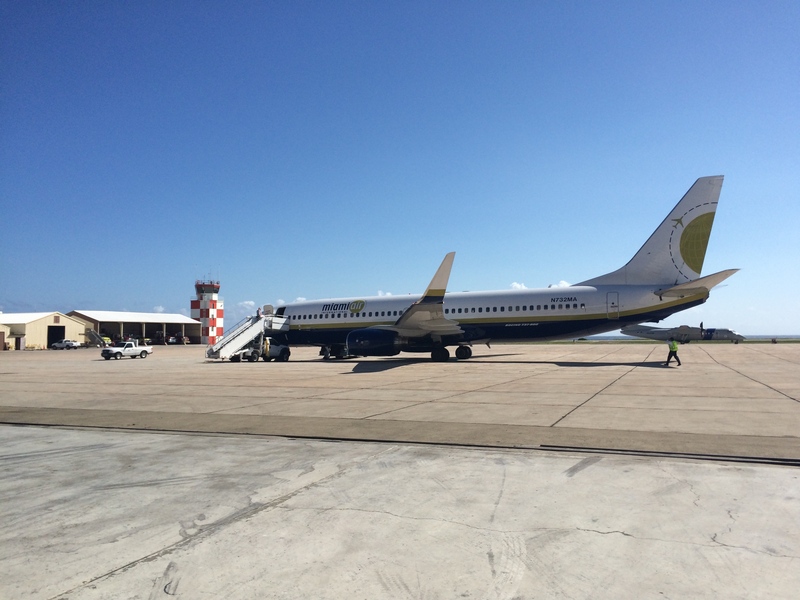 My Air Miami plane parked at Guantanamo Bay air field after arriving from Andrews Air Force Base. 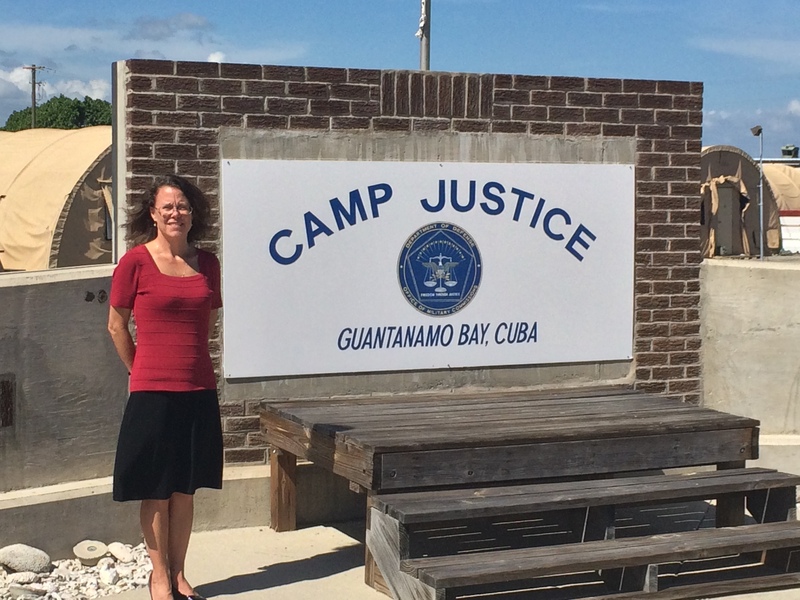 After a very pleasant flight, I arrived at GTMO a little after 1:00 p.m. today (Sunday). 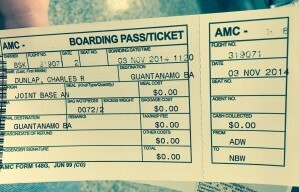 In addition to the contingent of NGO observers, press, and defense, prosecution, and judicial personnel, passengers on the flight included several “regular” military travelers to the Naval Station (i.e., military personnel with no involvement in the legal proceedings against the detainees but traveling to GTMO on other military business). The flight included a movie (Spiderman 2), a hot meal (choice of lasagna or chicken), and hot towel service. It was reminiscent of air travel in the 1980s! We were busy all afternoon getting badges for access to the court areas, obtaining supplies at the Naval Exchange, and doing a lot of waiting. Despite the warnings of recent Gitmo Observer travelers, I expected more from the Internet here. My attempt to purchase (at the cost of $150.00) wired Internet access from the NGO “internet cafe” was foiled for my lack of a proper adapter. I was able to make it into “town” at 7:00 p.m. to a location that reportedly had wireless Internet access only to find it was not functioning. Not only am I presently unable to post to the Gitmo Observer Blog, I am without any access to email or any other Internet-dependent mode of communication. 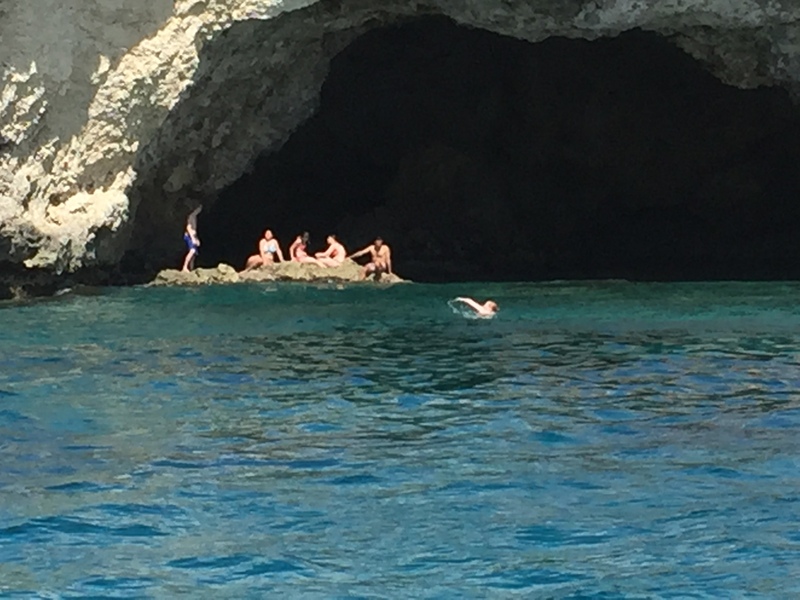 There is of course no cell phone service either. We’ll see what tomorrow brings on the communication front. In the morning, I expect to be escorted along with the other NGO observers to the courtroom in advance of the 9:00 a.m. commencement of this set of pretrial hearings in the United States’ prosecution of abd al Hadi al-Iraqi. Hadi is accused of several crimes arising out of his alleged role as an al Qaeda commander in Afghanistan during the post-9/11 period. Four motions are scheduled to be heard in this three-day session. PS: For access to the Guantanamo Bay Fair Trial Manual, click here. NGO Observers studying the Guantanamo Bay Fair Trial Manual. 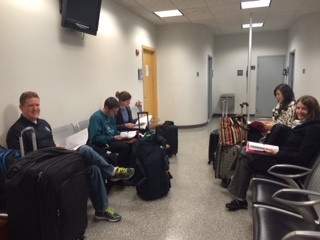 At Andrews Air Force Base waiting for our flight to Guantanamo Bay. I flew from Indianapolis to Washington National Airport yesterday afternoon, in preparation for this morning’s departure to GTMO. Through the gracious hospitality of old friends, I had a lovely place to stay for the night and was driven to the Andrews Air Force Base Visitor’s Center at 5:30 A.M. Non-governmental organizations (NGOs) such as the Gitmo Observer (of Indiana University McKinney School of Law) tend to have very meager budgets, thus most ­– if not all – of our representatives’ travel expenses are borne by the individual observer. 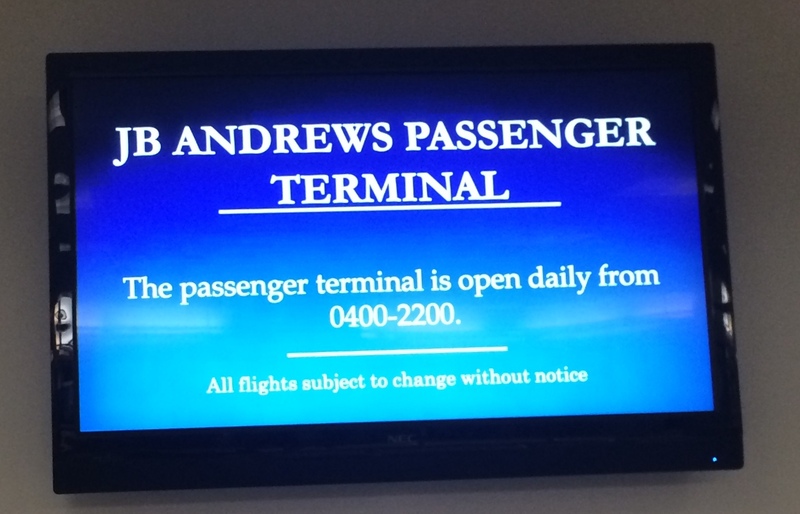 I must thank Spike Bradford, Jill Keesbury, and their son Angus for picking me up at National Airport, putting me up for the night, and driving me to Andrews at the crack of dawn. They are true friends indeed. 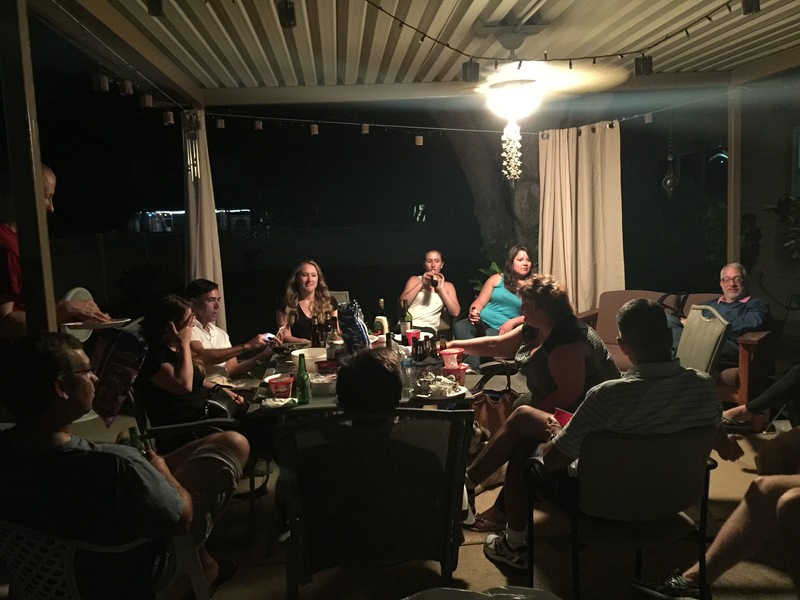 In addition, my hosts provided very stimulating pre-trip conversation. Spike works for the D.C. area-based Pretrial Justice Institute, a nonprofit organization promoting safe, fair, and effective pretrial practices nationwide. As the proceedings I will be observing this week at GTMO – those of Abd al Hadi al-Iraqi – are in the early pretrial stages, Spike offered me some perspective for comparison to U.S. domestic criminal courts. To me, the most stark comparison was between the different lengths of pretrial detention. In typical domestic United States criminal jurisdictions, the accused must be charged with a crime within 48-72 hours of arrest or detention, and then has the right (which he or she may choose to waive) to be brought to trial within a particular time limit. See, e.g., Ind. Rule Crim. Procedure 4(B) (affording accused the right to move for a trial within 70 days). In addition, the U.S. Constitution guarantees the right of the accused “to be informed of the nature and cause of the accusation” and importantly provides that “the accused shall enjoy the right to a speedy and public trial.” U.S. Const. amd. VI (emphasis added). The accused al Qaeda commander Hadi al Iraqi, whose proceedings I will observe next week, was first brought to GTMO in 2007 after being held by the CIA. Hadi was first charged with a crime in 2013. When I arrvied this morning at Andrews Air Force Base, I met several other NGO observers who will be attending this week’s hearings. One, a representative of the American Bar Association Criminal Justice Section, was already familiar with the work of The Gitmo Observer. I distributed copies of the Guantanamo Bay Fair Trial Manual to the NGOs and it was well received. Many other passengers continue to arrive at the Andrews terminal and are checking in for today’s flight, which is scheduled to depart for GTMO at 10:00 a.m. The things I CAN’T forget to take to GTMO! Tomorrow (Sunday) I will fly from Andrews Air Force Base to Guantanamo Bay Naval Station, Cuba to observer next week’s pretrial hearings in the U.S. prosecution of alleged al Qaeda commander Abd al Hadi al-Iraqi (17 – 20 November 2014). 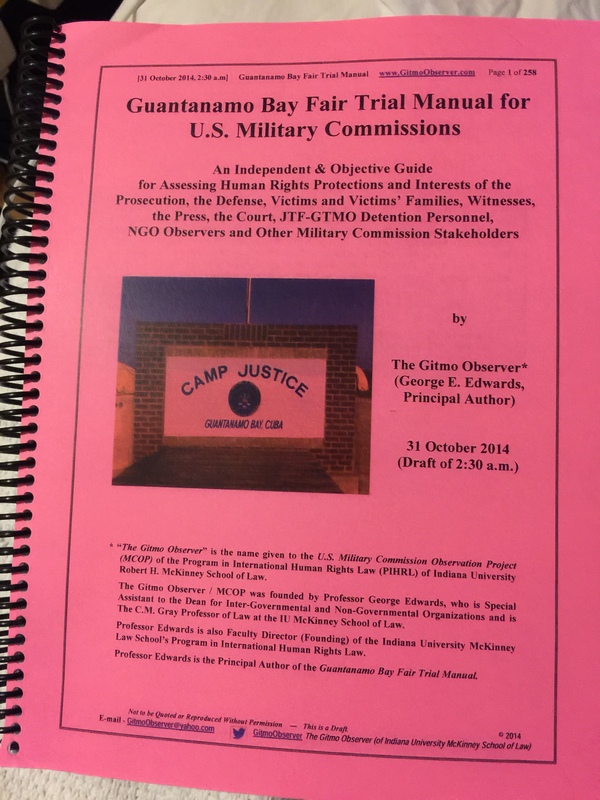 I will be transporting several updated draft copies of the Guantanamo Bay Fair Trial Manual to distribute to other non-governmental observers (NGOs). Last evening, I had the good fortune to be a guest in Professor George Edwards’ class in International Criminal Law at the Indiana University McKinney School of Law. 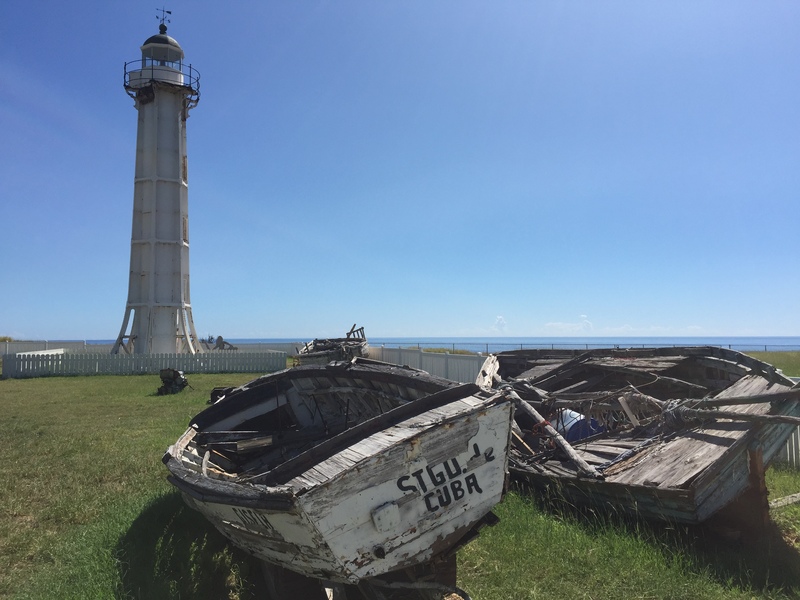 Professor Edwards, with help from students and others, has drafted the Guantanamo Bay Fair Trial Manual for use NGO observers and anyone else interested in determining whether stakeholders are getting a fair trial. I cannot thank Professor Edwards and his students enough for preparing the Manual and for welcoming me to their class. The Manual has been an indispensible part of my preparation, as it contains a trove of information about the treaties, U.S. laws, and regulations governing proceedings under the law of war, and international human rights law, and it also identifies the various stakeholder groups in these proceedings, all of whom have rights under these laws, treaties, and regulations. I am an attorney by profession, and my work involves primarily appellate review of both criminal and civil substantive law issues. Issues of procedure and particular rights arise from time to time but are by far most of my work involves more substantive questions such as, “Was a particular piece of evidence properly admitted?” and “Did the trial court properly apply the existing case law in instructing the jury?”. The rights issues I deal with are typically secondary to the substantive law questions. Further, to the extent I deal with rights issues in practice, these issues relate almost invariably to the rights of the criminal defendant. Therefore, participation in this MCOP project requires me to shift my legal mindset and approach the proceedings from a very different perspective. I have no previous experience in international law so of course the Guantanamo Bay Fair Trial Manual is extremely informative. But I found my visit to last night’s class was absolutely essential in helping me to make connections between the Manual’s exposition of human rights law procedures and the application of these rights to the stakeholders in practice. The students and Professor Edwards were able to help me focus on my role to assess whether the proceedings are delivering the rights to which each stakeholder is entitled, not what substantive law is at issue in the particular case. Today is Veteran’s Day and I am spending my day off from work preparing to attend next week’s pretrial hearings at Guantanamo Bay, Cuba. Next Monday, Tuesday and Wednesday (November 17, 18, and 19, 2014) proceedings will resume in the case United States v. Abd al Hadi al-Iraqi. 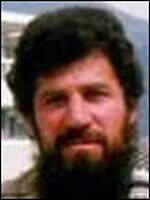 Abd al Hadi was brought to Guantanamo in 2007 after detention by the CIA. Abd al Hadi is charged with several war crimes arising out of his alleged role as an al Qaeda commander in Afghanistan during the years following the September 11th attacks. With regard to the last item, the judge issued an order on November 7 (AE021B) which has been reported to temporarily grant Abd al Hadi’s request for cessation of physical contact with female guards. Attend the hearings each day as an informed observer. 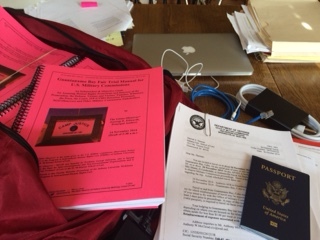 This requires a substantial commitment in terms of personal time and resources, including arranging for travel to Andrews Air Force Base, completing numerous government and MCOP documents, researching the status of the case and the motions to be heard next week, and reading and studying the Guantanamo Bay Fair Trial Manual prepared by MCOP. Objectively and with an open mind observe the proceedings and interact with stakeholders present on site (including prosecutors, defense counsel, press, and other NGOs) to glean as much information as possible about the experiences of all stakeholders holding rights to fair proceedings at Guantanamo. My observer’s role on behalf of MCOP is to analyze to proceedings not so much from a substantive legal perspective, but rather to focus on the various fair trial rights of all stakeholders to the proceedings. This includes identifying both positive and negative aspects of the process, both in the abstract (e.g., as compared to other judicial processes) and in practice at the hearing site. Where possible, assess the fairness of the proceedings with regard to the various stakeholders. Disseminate, through the Gitmo Observer and otherwise, information about the hearing process and the fairness of the proceedings. Prepare a report for MCOP upon my return. 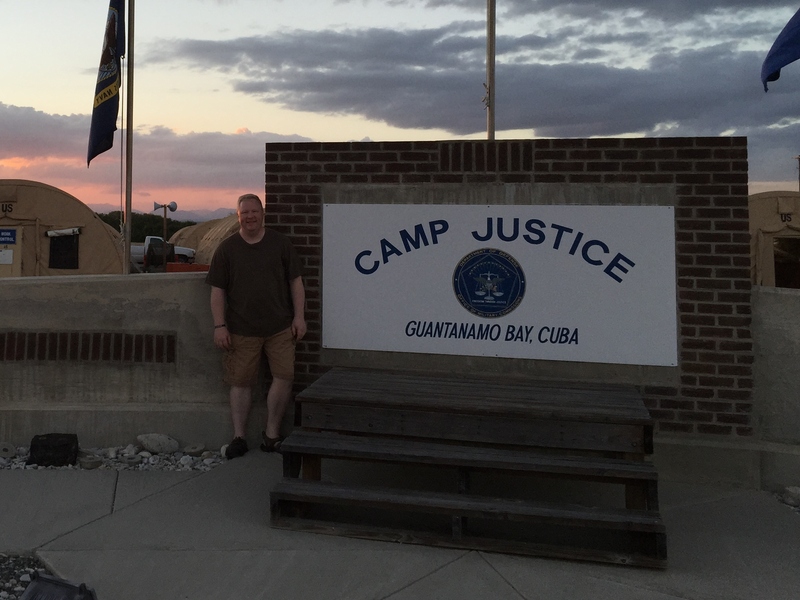 As I read Chuck Dunlap’s blog posts this week, I find myself looking more and more forward to my upcoming trip to Guantanamo for the next round of hearings (Nov. 17-19, 2014). 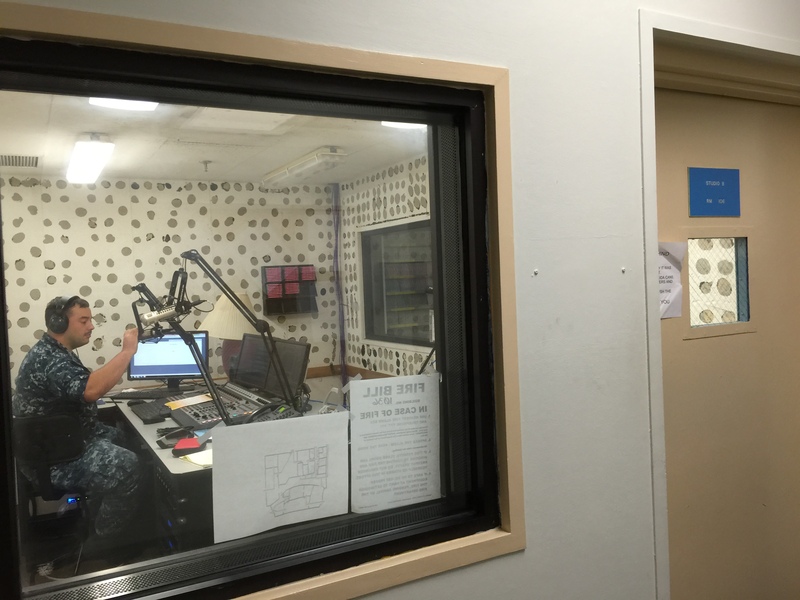 Chuck is an Indiana University McKinney School of Law graduate who works at the Indiana Bar Foundation, and he is at Guantanamo Bay this week monitoring the hearings in the case of al Nashiri, who allegedly masterminded the 2000 attack on the USS Cole that killed 17 sailors off the coast of Yemen. I will be monitoring a different case, that of Hadi al Iraqi, who was alleged to have run al Qaeda’s army in Afghanistan, was arraigned this past summer, and his pre-trial hearings are at an early stage. Yesterday I received instructions from the Pentagon to help me prepare for my mission, including information about the logistics of eating, sleeping, and – most importantly – viewing the proceedings. Reading Chuck’s posts and seeing his photos makes it seem more real all the time! And I have been especially fortunate this past week to have had short conversation with Indiana Supreme Court Justice Steven David about the Naval Station itself and his experiences there. Justice David, is his position as an Army Colonel, previously served as chief defense counsel. Of course, our conversation was quite limited due to the nature of the subject but it was nonetheless very helpful and exciting to meet with someone who has had his “boots on the ground” at Guantanamo. Although I won’t be leaving for Cuba for another week, my good friend and co-worker Traci Cosby is leaving tomorrow for Havana. 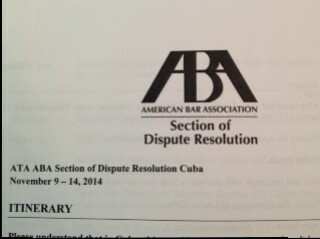 Traci will be part of a delegation from the American Bar Association Section of Dispute Resolution spending several days in Havana meeting Cuban dignitaries and learning about the Cuban legal system. How strange it is that two friends and close co-workers would end up – entirely independently – traveling to Cuba in the same month! Obviously, Traci’s and my experiences of Cuba will be very different. But I look forward to swapping stories with her when we both return. 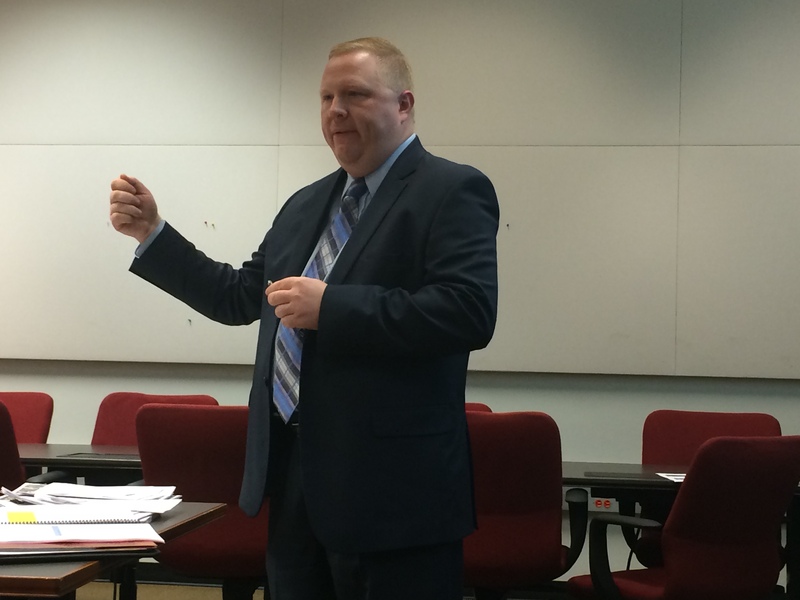 Chuck Dunlap lectures in Professor George Edwards’ International Criminal Law class. Students in the class have conducted research on fair trial rights to incorporate into the Guantanamo Bay Fair Trial Manual. Days before his mission to the Guantanamo Bay Naval Station (GTMO), Charles (Chuck) Dunlap lectured about the Military Commission hearings he will monitor at the remote military outpost on behalf of the Military Commission Observation Project (MCOP) of the Indiana University McKinney School of Law. Mr. Dunlap is scheduled to observe pre-trial hearings in the case against Abd al-Rahim al Nashiri, who is alleged to be a mastermind of the 2000 suicide attack on the U.S.S. Cole off the coast of Yemen. The attack killed 17 U.S. sailors and wounded several dozen. 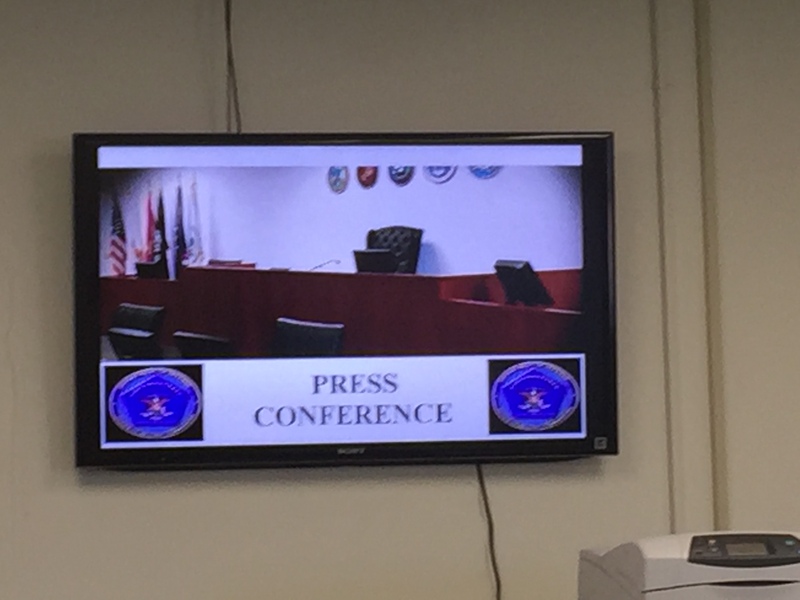 The Military Commission Observation Program has been sending Indiana McKinney School of Law to monitor hearings at Guantanamo Bay and at Ft. Meade, Maryland, where the GTMO hearings are simultaneously video-cast on secure lines. 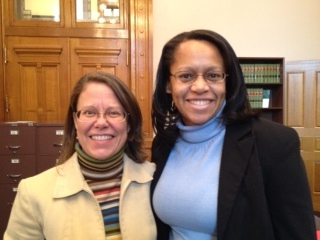 The MCOP mission is for IU McKinney students, faculty, staff and graduates to attend, observer, analyze, critique, and report on pre-trial hearings and trials. 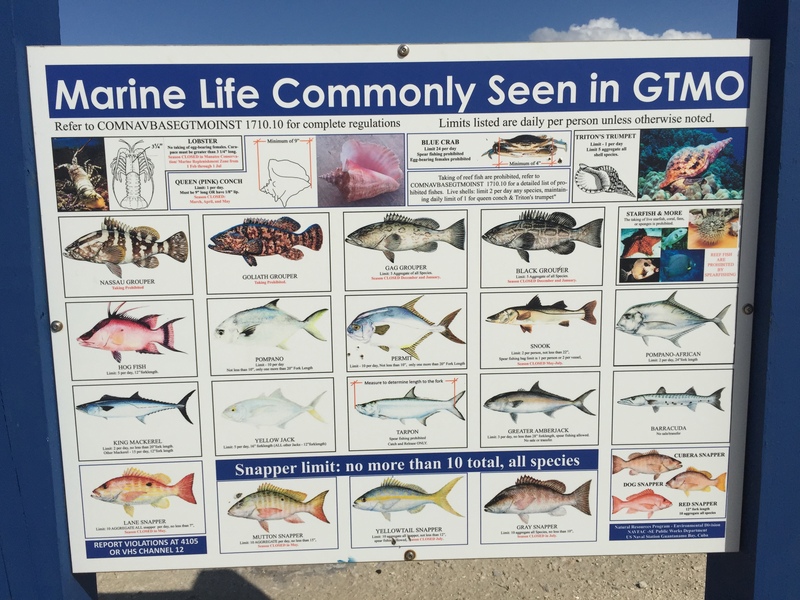 MCOP monitors are expected to use the Guantanamo Bay Fair Trial Manual as a tool to help them ascertain whether they believe that all Guantanamo Bay Stakeholders are receiving a fair trail. 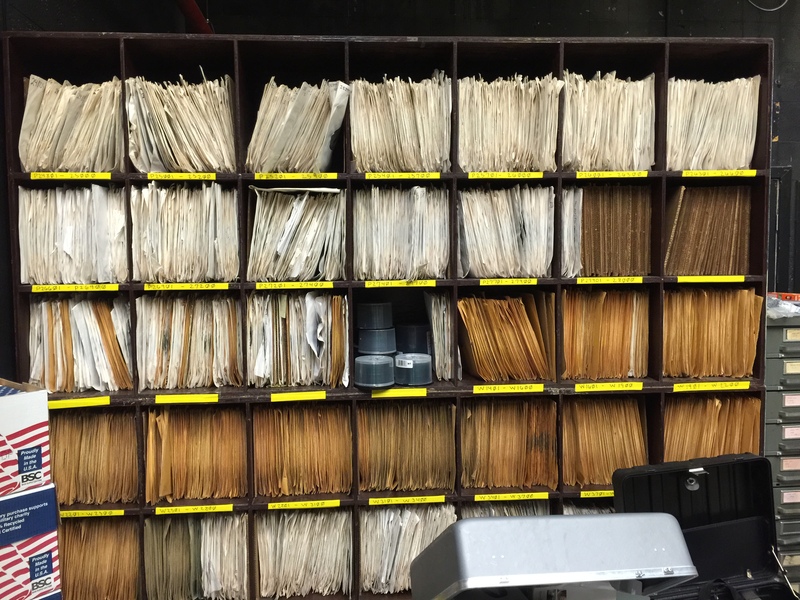 the Manual lists dozens of fair trial rights that are to be afforded to the prosecution, victims and victims families, the defendants, the press, security and other personnel who work with the prisoners and with the court, the U.S. public, and others. Professor Edwards and Mr. Dunlap and stack of Guantanamo Bay Fair Trial Manuals Mr. Dunlap will carry to Guantanamo Bay for NGO Observers to use in assessing fair trial rights. Copies of the draft Manual can be downloaded from www.GitmoObserver.com. 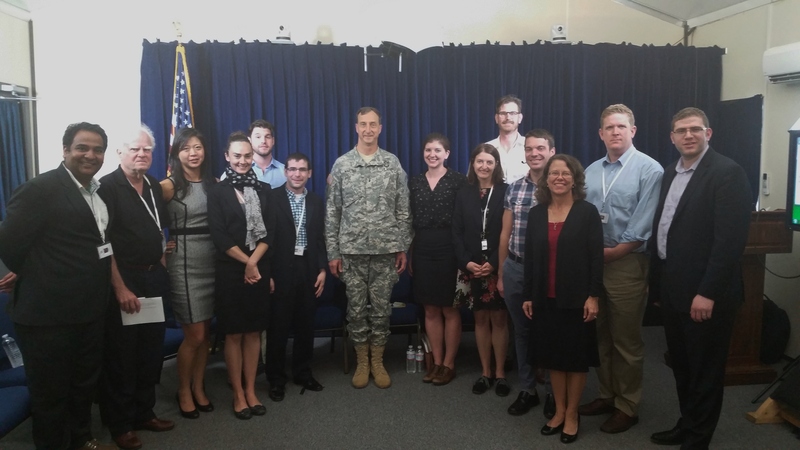 IU McKinney law students enrolled in Professor George Edwards’ International Criminal Law class have been conducting legal research that is being incorporated into the Guantanamo Bay Fair Trial Manuals. Mr. Duncan met with students in the class, lectured on issues to be raised during the al Nashiri hearings during his mission, and discussed with the students their research. 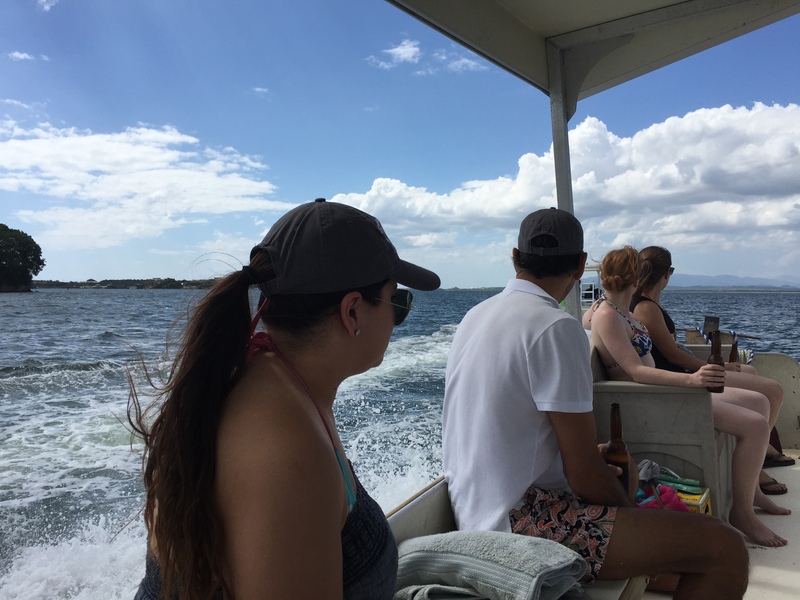 Each student in the class has been assigned one or more specific fair trial rights to explore, and the students are examining the international law and domestic U.S. law that define the rights in the Guantanamo Bay context. 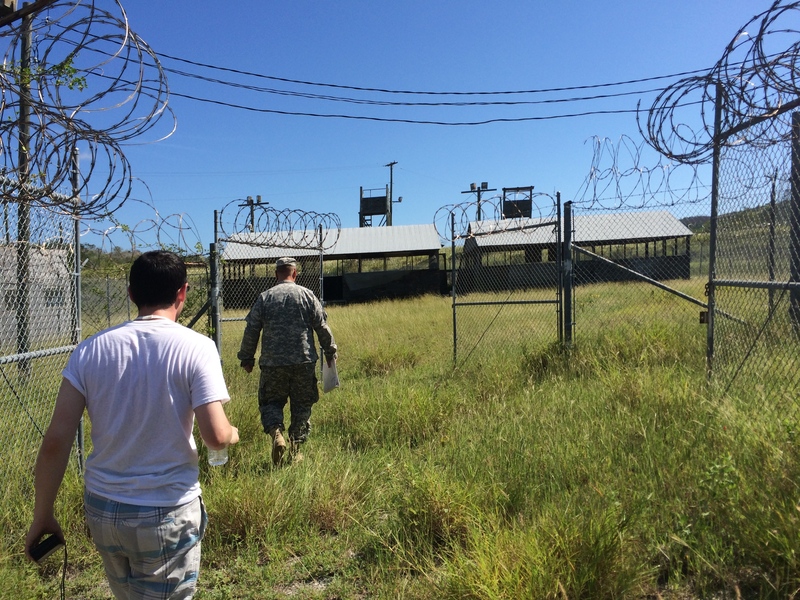 Mr. Dunlap traveled to Ft. Meade several months ago to monitor Guantanamo Bay hearings. 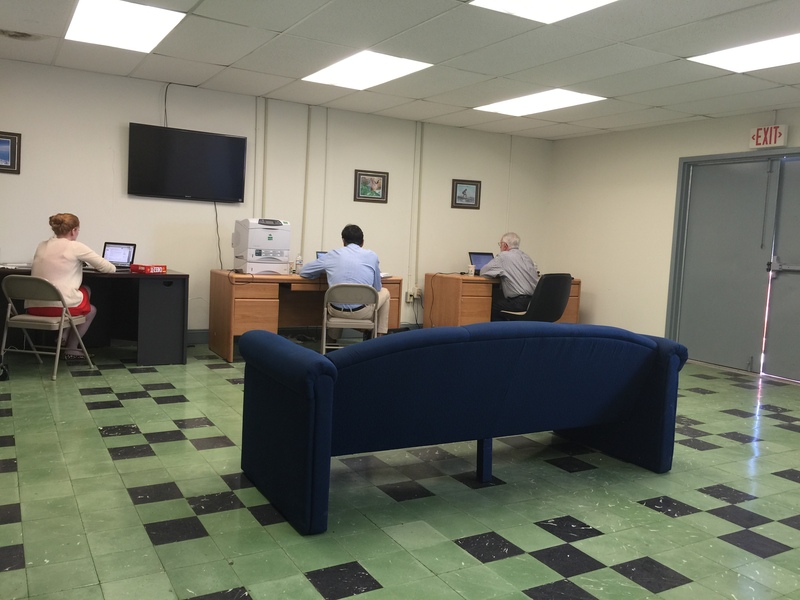 The MCOP, which is also known as The Gitmo Observer, is part of the Indiana University McKinney School of Law Program in International Human Rights Law. Professor Edwards is the founder of the Program in International Human Rights Law, and the MCOP / Gitmo Observer.